A pillar standing roughly eight feet tall made of local rocks holds two bronze plaques. The plaques are unadorned other than the inscriptions. The larger top plaque holds the main inscription and the smaller lower plaque contains dedication information. 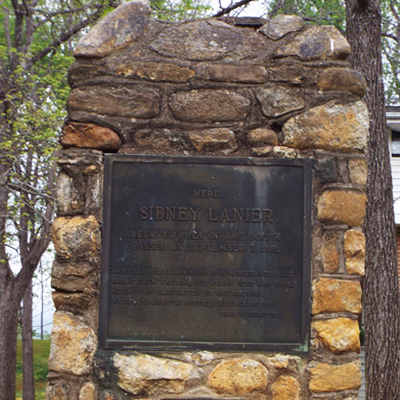 The memorial stands in front of the house where Lanier died in 1881. Mrs. H.L. Sheip, a relative of Sidney Lanier and the memorial’s donor, was scheduled to present the plaque. The Rev. Clarence Stuart McClellan, Jr., the creator of the “Open-Air Westminster of the South,” in Fletcher was scheduled to be the master of ceremonies. Sidney Lanier was also immortalized in stone at the Duke Chapel in Durham, NC as one of the three “Great Men of the South.” He was a widely acclaimed poet, musician and author. Originally from Georgia, he spent many of the Civil War years in North Carolina before being captured in 1864 while serving on a blockade runner. He acquired tuberculosis in 1865 and finally succumbed to the disease in 1881 shortly after moving to Lynn near Tyron in Polk County, NC. 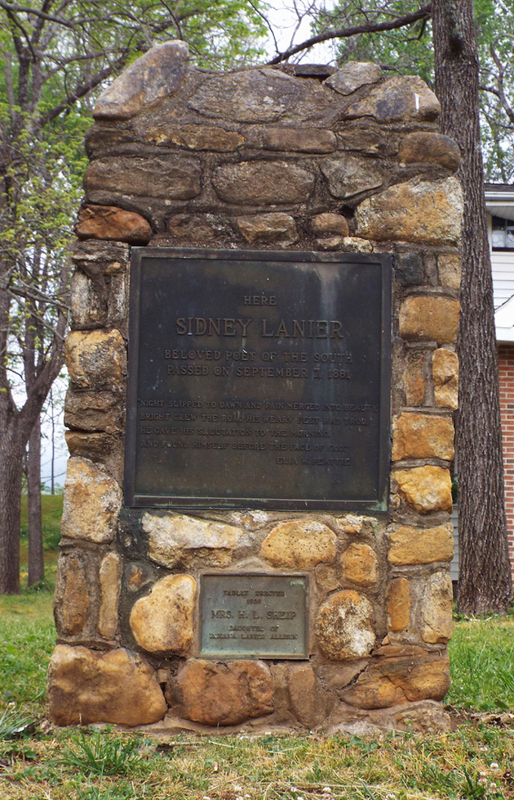 An earlier memorial to Lanier had been dedicated in the “Open-Air Westminster of the South” in Fletcher in 1928. The memorial is located at 2753 Lynn Road, Tyron, NC. It stands in the lawn of a private residence. There is no room to pull off the highway in front of the house. A nearby church thrift store parking lot is a short walking distance away. The memorial markers stands on the front lawn of a private residence, under mature shady trees.